Peaks Island children’s book author/illustrator Anne Sibley O’Brien has made an important contribution to the upcoming city-wide read of books supported by the Maine Humanities Council called “I’m Your Neighbor, Portland.” When she’s not crossing the globe by plane to visit fans, crossing the harbor by ferry or the island by bicycle to go home, she’s adding to her impressive list of children’s book publications. 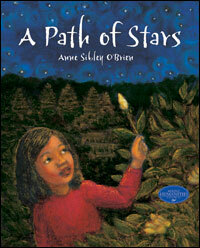 A Path of Stars has been named a Notable Social Studies Trade Books for Young People 2013 by the National Council for the Social Studies (NCSS) and the Children’s Book Council (CBC); it has also been named an Honor Picture Book of the Asian Pacific American Award for Literature 2013 based upon its literary and artistic merit, as selected by the Asian Pacific American Librarians Association. Anne illustrated another one of the nine books chosen for this city-wide read: Moon Watchers, an inside view of daily life in a modern Muslim family during Ramadan. A launch event for the city-wide read of books set in Maine’s new arrival communities will occur on May 25th from 3-6 p.m. at the Portland Public Library.